On the Astrogeographical Position of Mexico City and transits of the outer planets in relation to the government of Mexico. Political astrology & history. This article is not finished – I`ll be working on it in the next 2-3 weeks or so – please check out after some time how far I got in collecting data and information. Thank you!!! Astrogeographical resonance degrees of Mexico City for morphogenetic field level 1 which describe the supraregional, global topics of the capital of Mexico and its governements: the central area of mexico City is located at around 10° of aristocratic air sign Libra sign of openness, decoration, relationship, beauty, peace, courtly culture and around 14° of dynamic fire sign Sagittarius the sign of priest castes, knowledge, thinking, philosophy, shamanism, style, design, fashion, ornamentation and luxury. 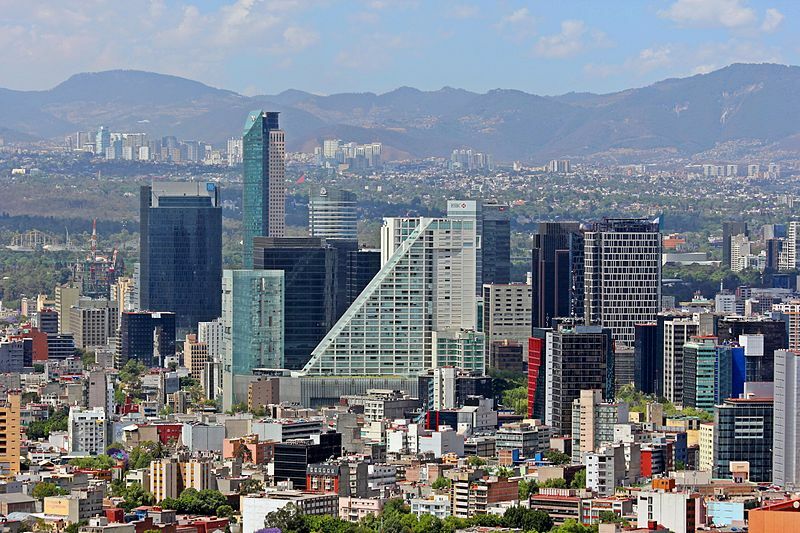 Neptune had first approached the square position to the 14° Sagittarius resonance degree of the mexican capital and government when he reached 12°Pisces by June 2016. That moment fell right in the process of the nomination of Donald Trump as official candidate for the US Presidential Elections of November 9 2016. During his campaigns Trump had announced to built a wall between the USA and Mexico and to make Mexico pay for it. And Trump had also declared his plans to threaten mexican exports into the USA. The Neptune square thus materialized as an announcement of public subjugation and humiliation of the Mexico including a statement of superiority by the coming president of the country´s dominant northern neighbour. In fact Neptune did not actually threaten the territorial integrity of Mexico. But it has caused a serious insecurity (Neptune) about the future development because of Trumps allegations that the Mexican economy was dependent on the goodwill of the USA. A final evaluation of the effects of this square transit cannot be made before it will be over in the spring of 2020. Furthermore it seems remarkable that the exterior threats to the mexican government have been effective on a propagandistic level rather than through direct actions. On an interior level the climax of the Neptune square was acompanied by a change of governement through a landslide victory of the social democratic MORENA movements and its allies in the General elections of July, 1 2018. The 2018 General Elections were held with the Sun indicator for the head of government (kingdom) at 10°Cancer exactly square the 10°Libra astrogeographical resonance degree of Mexico City. As the mexican general Elections are set to take place on that same date every six years and a President once elected is not eligible for reelection that Sun position at 10° Cancer defines the regular change of the head of government with each general election. Retrograde Neptune indicator for a process of self -healing, self – realization and awareness of ones own weaknesses and corruption was square to the 14°Sagittarius resonance degree of the capital and government from 16°Pisces. 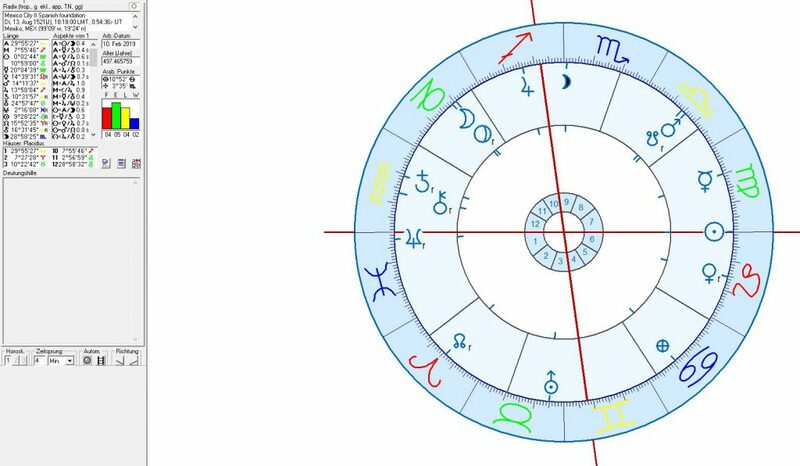 The next tight transit of tension from one of the outer planets will be from Saturn moving over the 14°Pisces square position to the 14°Sagittarius resnance degree of Mexico City in time for the 2024 General Elections that will be held on 1 July of that year. 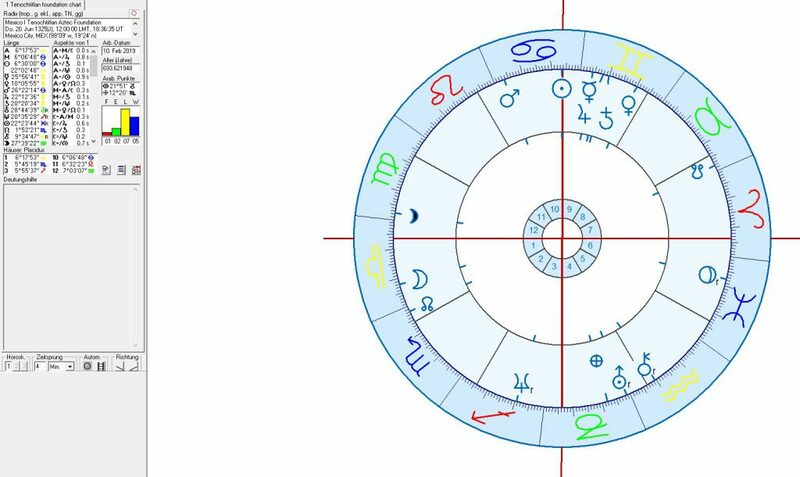 Astrological chart for the Mexican General Elections on 1 July 2024 calculated for 12:00. Like many other South American revolutions and declarations of independence he Mexican War of Independence between 1810 and 1821 was a consequence of the Napoleonic Wars in Europe which terminated the Spanish hegemony over large parts of the Americas. 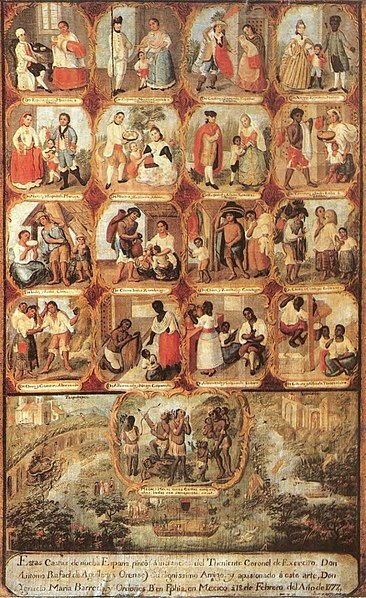 The hierarchy in the Mexican Caste System established during the spanish colonial rule. 18th century painting. Pluto squares to the mexican capital appear to represent the most important factor in the two most important events that changed the political system in Mexico: during the abolition of the spanish colonial rule over Mexico in 1810 and also during the spanish conquest of the Azetc Empire in 1521 when Pluto had been in exact square position to the 10°Libra resonance degree of the mexican capital from 9°Capricorn (see chart below and also my article on Tenochtitlan). The Mexican War of Independence began in November 1810 with intense pressure on the mexican government from Pluto at 16° Pisces square to the 14°Sagittarius resonance degree of the capital area in Mexico City. Pluto stood for the challenge to the stability of the existing government through the need for adaptation to factual changes in the social, economical, cultural and technological situation and living conditions in the country. At the same time Neptune the planet of dissolution of instable structures and conjunct saturn the planet of stabilization, reforms and establishment of solid and long-lasting governmental institutions were approaching the 14°Sagittaris resonance degree of the Mexican governments. The chart for the Federal Mexican Constitution of 1857 shows highly intense aspects in relation to the 10°Libra resonance degree of the capital Mexico City. 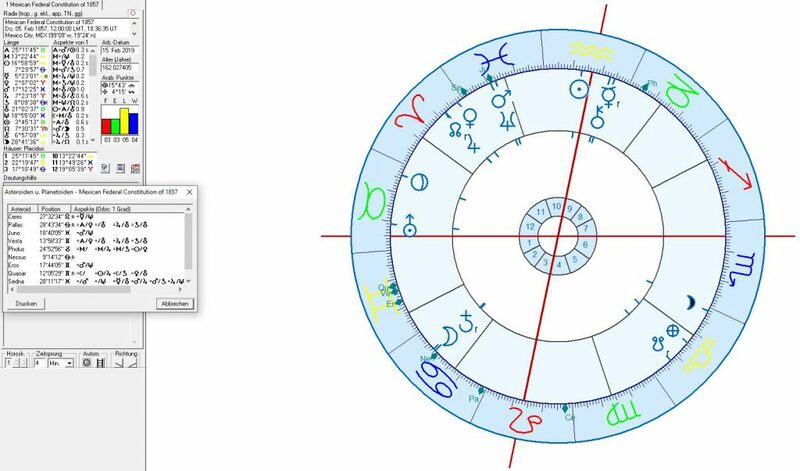 The Moon – Saturn conjunction near 8° Cancer square to Mexico City shows an act of emotional separation and of cutting the umbilical cords with the colonial power and other ties and obstacles during the birth process of the mexican nation. 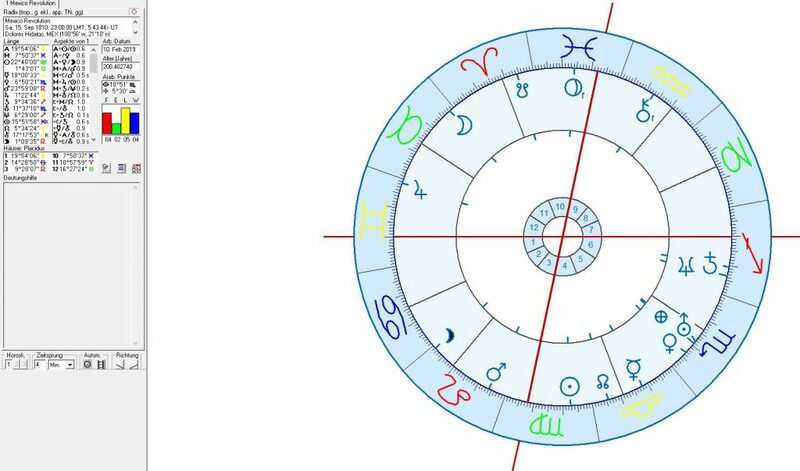 Jupiter the planet of victory was cojunct the North Node indicator of the actual aim of the constitution at 7°Aries and in opposition to the 10°Libra resonance degree of the capital city and central government. This constellation seems to emphasize the strengthening of the importance of each single (Aries) state in the federation but also challenge the of emotional identification with the central government through the square to the Moon-Saturn conjunction in Cancer. A third important and highly destabilizing aspect was the hidden, inofficial challenge from the Mars – Neptune conjunction near 18° in the sign of Pisces a major factor for corruption and secret manipulation in a mirrorpoint opposition to the 10°Libra coordinate of the central government. 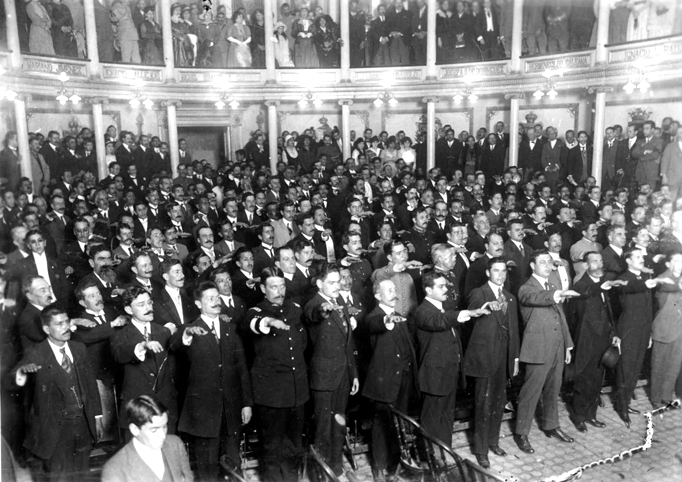 The new constitution was ratified on February 5 the day of the 60th anniversary of the ratification of the Federal Constitution of the United Mexican States on February 5 1857. 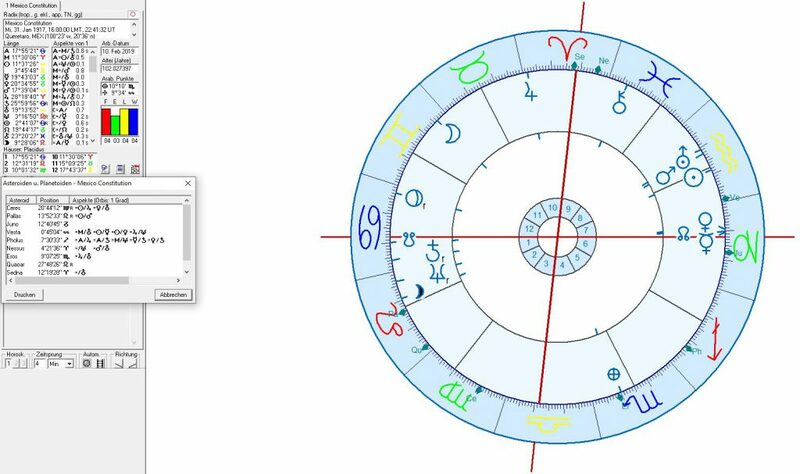 In the chart for the signing of the constitution a Mars – Uranus – Sun conjunction in creative, innovative, holistic, rebellious air sign Aquarius the sign of emancipation, self-finding, socialism and revolution marked the attempt to liberate the poor and lower classes and create a futuristic and long lasting (fixed sign) visionary concept for a modern society. 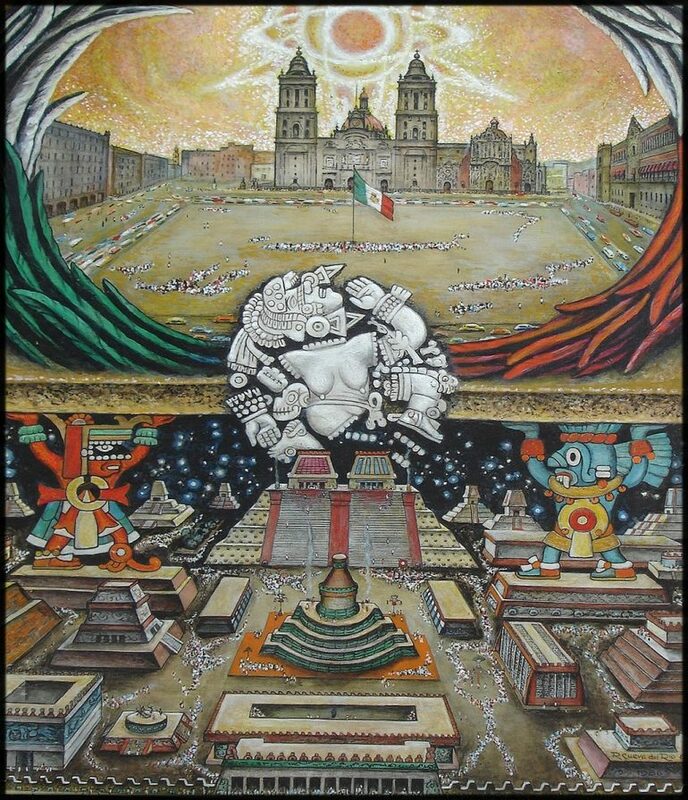 For the scientific discussion on precise historical data about the arrival of the Aztecs and the foundation of their tenochtitlan compare: The fifth sun, with ancient Mexican history and astronomy. According to the Aztec tradition Tenochtitlan supposedly the first large settlement at Mexico City was founded on 20 June 1325 on an island inside the shallow Lake Texcoco that covered much of what is today the city area. There is archeological evidence of the existence of older settlements. Birth chart of Mexico City I: The foundation of Tenochtitlan according to Aztec/Mexica tradition. calculated for 20 June 1325 (julian date) at 12:00 noon. The planetary transits of June 1325 show no exact aspects through to the astrogeographical coordinates of Tenochtitlan/Mexico City. The fact that Neptune (at 20°Sagittarius) had been transiting the 14°Sagittarius coordinate of the city for between 3 and 6 years before the supposed foundation date could indicate that the Aztec rise to power in the area was a consequence of destabilization among the local population rather than a complete new start. even more so because Saturn had been transiting in opposition to Neptune and Tenochtitlan shortly before the supposed foundation date. 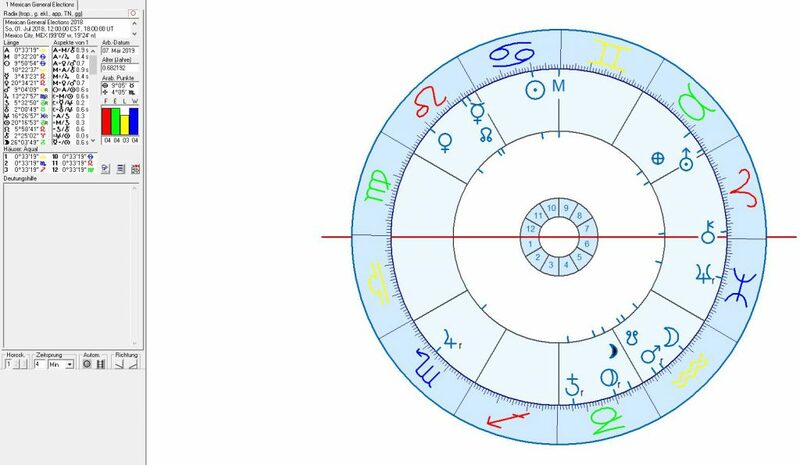 The astrological chart for the moment of the spanish conquest of the city and the foundation of the spanish City of Mexico reveals an extremely intense resonance of the transiting planets with the astrogeographical coordinates of the place. One of several extremely intense planetary transits of the astrogeographic positions of Montezuma´s capital was Jupiter – the planet of victory in transit of 14° Sagittarius (the sign of shooting and hunting) exactly conjunct the astrogeographic coordinate of Tenochtitlan at 14° Sagittarius. Jupiter was in exact trine with Venus in Leo the sign of royalty and the North Node in Aries the sign of warfare. This coincidence emphasizes the intense energetical focus on the town on that day describing the attack as carried out in a highly auspiscious moment. The fact that Jupiter did not effect luck to the defenders but to the invaders here – supports the assumption that the international role of Spanish culture is ruled by Jupiter´s own sign Sagittarius. Birth Chart for Mexico City II: Spanish occupation of Tenochtiland and the foundation of modern Mexico City on 13 August 1521 calculated for sunset dogmatic and deadly influence of the spanish gold hunt and catholic dogma in the form of a square to the aztec religion and culture whose significator is the astrogeographic coordinate in Libra here. The ideological impact of Pluto in Capricorn can also be observed in the extinction of the open pantheon of the colourful aztecs gods (Libra as an indicator for angels and other celestial beings) by the narrow -minded state religion of spanish monotheism (Pluto in Capricorn).